Our Greenbrier Changing Lives Martial Arts facility offers programs for Karate for Kids, Martial Arts for Adults and Krav Maga. 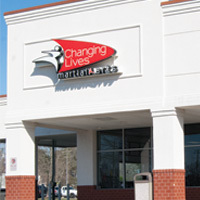 This location is one of the oldest martial arts facilities in Hampton Roads and has been serving the community since 1996. We have been serving our local Chesapeake community, Military Members, Law Enforcement Officer, City Employees, Firemen, and civilians with Karate For Kids, Martial Arts for adults and Krav Maga. Please feel FREE to register for our special offer or call us at 757-382-9022.